We’ve gathered our visitors frequently asked questions to help you plan your next visit to the Market! 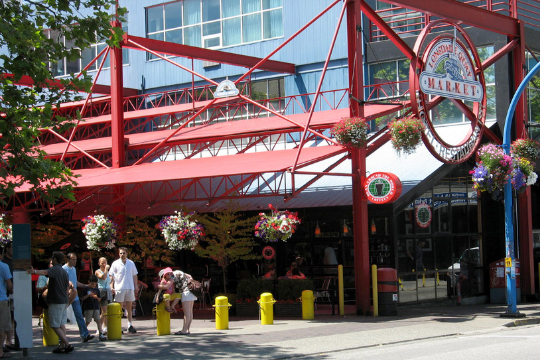 What are Lonsdale Quay Market’s hours? The Market level (1st Floor) is open 9:00AM – 7:00 PM Monday through Saturday, Sundays the Market is open 9:00AM – 6:00PM. The Retail Level (2nd Floor) is open 10:00 AM – 7:00 PM. The restaurants and brewery are open late. Stay up to date on seasonal hours and holiday closures on our Facebook Page. The Market has underground parking reserved for Market customers only. The first hour is free. Any time after that is $3 an hour and parking is available for up to 3 hours. After 6:00 PM and on weekends the ICBC parking lot has free parking for Market customers. What are the Q Tower Stairs hours? 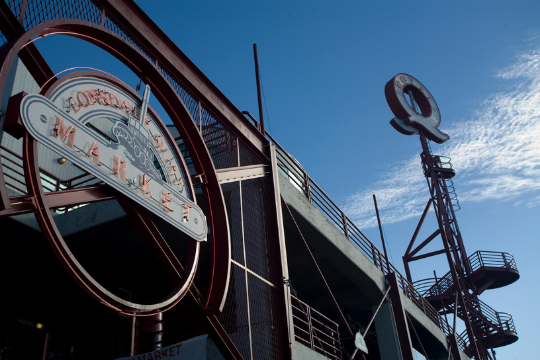 The Q Tower Stairs are open during Market Hours. You can walk up 77 steps to the top of the viewing deck and take in the beautiful sights of the Vancouver skyline. When is the best time to visit the Market? Mornings before 11 AM tend to be less crowded. After 5:00 PM there is usually less traffic. Peak season at the Market is generally May – September. The Market itself does not have free wi-fi, however some of the individual vendors will share the wi-fi password with their customers. The Market does have Shaw and Telus wi-fi hot spots. Is there stroller and wheel chair access? The South Plaza has ramps and there are three elevators in the Market. One red elevator by the North Entrance and two down the hallway by Quay News. The lost and found is located at the Lotto Booth on the first floor. Any lost items will be returned there. For inquiries please call 604.990.0649. Where can I stay near the Market? Lonsdale Quay Market has their own hotel which is located on the third floor of the Market. For bookings please call 604.986.6111. Is there a place to store my luggage? Unfortunately there are no storage spaces available at the Market. Majority of the hotels downtown will store baggage for a small fee. Does the Market allow pets? Pets are not allowed inside the Market. However pets are allowed to walk outside the Market and on the South Plaza. What are the Market’s policies on Photography/Video? Visitors are welcome to take photographs and videos for their own personal use. All commercial photography and video must be cleared by the Market at least 48 hours prior. Contact Jas at jasdeep@quayproperty.net for any inquiries. Where can I pick up brochures about the Market? Lonsdale Quay Market brochures are available outside the Visitor’s Centre by the North red elevator. How do I find a specific business or merchant? All long term tenants are listing under Vendors on our website. Is there a community space to rent out for events? The Market has devoted a space specifically for community rentals. The room is located on the Retail Level of the Market next to Esplanade Dental Centre. Click here for details on Nest Community Space. Contact 604.985.2191 for inquiries and bookings. How can I open a store at the Market? The Market has opportunities for both long term and specialty leasing. Specialty Leasing is the rental of common areas at the Market, including indoor and outdoor spaces. If you are interested in becoming a Short Term Specialty Leasing Vendor please apply here. Once you have submitted your online application, a member of the Market Office will contact you. If you are interested in Long Term Leasing please complete the Leasing Inquiry Format the bottom of the page. Once your form has been submitted, a member of the Market Office will contact you to discuss your application further. You can send these in to e-comments@lonsdalequay.com. How can I perform at Lonsdale Quay Market? Buskers are permitted in designated areas with a busking permit. Busking applications are available on our website. The application process can take up to two weeks depending on the volume. Any busker who does not have their busking permit will be removed from the Market. Please make an appointment with the Market Office once the application is filled out.